Carved Stone Creations specializes in custom architectural stone, not “one-size-fits-all” catalog shopping. Stone Fireplace Design Carved Stone Creations specializes in custom architectural stone, not one-size-fits-all catalog shopping. We take your concept from photos, line drawings, and sketches  then combine your fireplace design with actual firebox dimensions and your floor plan. This results in stone fireplace designs that are uniquely yours and designed to fit your home. When it comes to installing our custom design fireplaces, we dont want to find out the hard way that something doesnt fit as we are trying to install it in someones home. Especially since our designs are hand-carved from imported stone. In order to insure that your fireplace fits the existing building or new construction and we avoid any unforeseen problems or concerns during installation we design all of our custom fireplaces with advanced 3D Modeling and Engineering software. This way we can design the fireplace from the ground up and virtually assemble it as well. This also gives interior designers, architects, and clients the opportunity to see an accurate visualization of the design that can be rotated and viewed from all angles. We can even send a 3D .pdf file that can be opened from almost any computer without the need for special software. 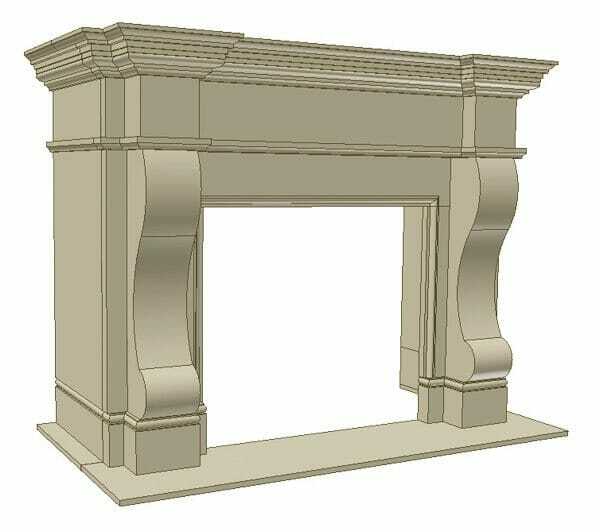 Here’s a complete 3D model for the finished fireplace you see at the bottom of the page. 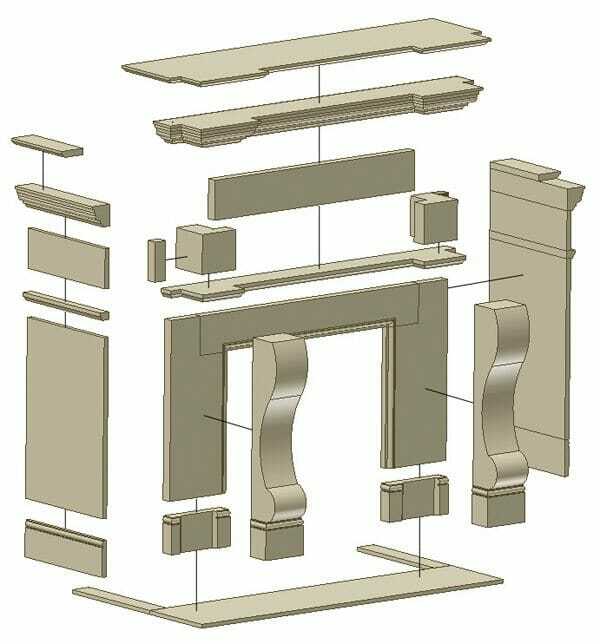 As you can see here in the exploded view below, we design our fireplaces to be assembled from several smaller components. This reduces the thickness of the material used, decreases the weight of the components, and allows for adjustments on the fly as we install the fireplace. Say the floor is uneven or the walls arent entirely flush on one side, we can account for this by modifying smaller components as progress in the assembly process rather then having to try and alter a much larger and heavier part. This can also reduce our installation time from days to potentially a matter of hours! The following photo shows the installed carved travertine fireplace. Because of our fireplace design expertise, this complicated fireplace surround with bump-out wall and returned mantel was installed in a few hours not days. Contact us to take your unique fireplace design ideas from concept to reality. Carved Stone Creations is located in Kaukauna, WI and we are a reasonable drive away from many Midwest States including Illinois, Indiana, Minnesota, Michigan, Ohio, Iowa, Missouri, Nebraska, and the Dakotas. Visit our showroom to see first hand what we can design for you. Our convenient centralized location also means we can bring all of the tools and heavy equipment we need to tackle any installation job. In addition to natural stone fireplaces we design and install many other types of architectural stonework including staircases, fountains, exterior stone veneer, window and door surrounds, fountains, statues, and much more! Outside of the Midwest? We can install there too. We have done work from New York to Florida to California as well. Learn about various fireplace styles in our free fireplace design guide.